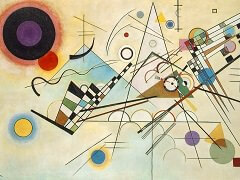 Paul Klee and Wassily Kandinsky: two names that have come to stand almost as synonyms for classical modernism. 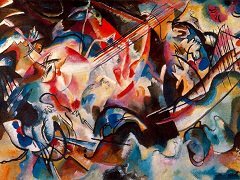 They are associated with fundamental avant-garde movements such as the Blue Rider and the Bauhaus, and regarded as founding fathers and pacesetters of abstract art. 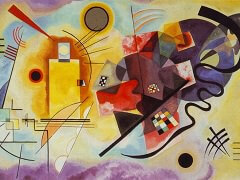 History also records their relationship as one of the great friendships in twentieth-century art. 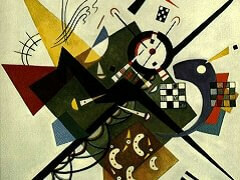 The Bauhaus was founded in Weimar, Germany, in 1919 as a state-sponsored school of art, architecture, and design. The utopian aims of the Bauhaus and its founder and first director Walter Gropius included raising the quality of everyday life through integrated design based on an aesthetic of modernity and universality. The school's curriculum was organized on the principle that the crafts were united with the arts on an equal footing (as they had been in medieval times) and according to the guild system of training under the tutelage of masters. Sharing Gropius's vision of an international community of artists, Wasily Kandinsky and Paul Klee were among the school's first teachers. 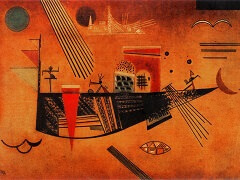 Joining the Bauhaus in 1922, Kandinsky first taught mural painting and, beginning in 1927, what would become his popular free-painting class. During his tenure from 1921 to 1931, Klee taught workshops in diverse subjects such as bookbinding, glass painting, and weaving in addition to painting. 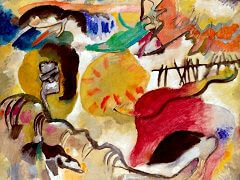 When the school was forced to relocate in 1925, Kandinsky and Klee also moved to Dessau, where they shared a double house from 1926 to 1931. 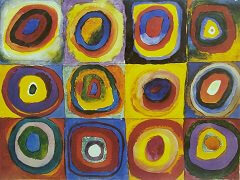 Klee and Kandinsky were indeed close, though never uncritical, friends for almost three decades. Central to the rapport between them was a focused engagement with each other's art sustained by many shared aspirations as well as differences on personal and artistic levels. Both artists strove to spiritualize art and explore the intrinsic laws of its visual means. 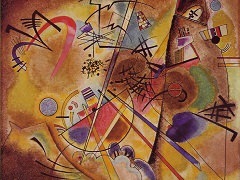 Yet Klee's ironically refracted realism was alien to Kandinsky's idealism, and his protean individualism clashed with his friend's pursuit of the autonomous laws of abstract art.